This was a Monday. Let’s see… we woke up late and did nothing but bum it on the beach and at the pool that day. Oh! There was one thing that I don’t have photos for! We rented jet skis! We had never ridden them before so I was a wee bit nervous but it was SO much fun! We rented them for a half hour (we both were on the water on our own jet ski at the same time) which was perfect because towards the end, I was starting to become hypnotized by the waves and I was starting to zone out. It was so nice to see Juan’s big huge grin every time we would pass by each other. It was really cool. This was our first tour. We took the Paradise Escape Tour. They picked us up at the hotel and dropped us off at another pickup location. This is where they rounded up all the different hotel people. We boarded a large air conditioned charter bus and headed to the south side of the bay through the city. It was nice to check out the city from a higher vantage point (in the bus). Once we got out of the immediate vicinity, we started to make our way to the jungle. We passed Mismaloya where Night of the Iguana starring Richard Burton was filmed (never saw it, but we heard about this from everyone, including my dad when we got back). It started to get more and more green and lush. We made our way into the muddy wet hills. On our charter bus. The pavement on the roads ran out. We started to go through areas that I would have completely made Juan turn around in a CAR. This was a full sized freakin charter bus! Oh Latin America, how you never cease to amaze me with your crazy driving skills. Higher and bumpier we went. We passed Chino’s Paradise, which we came back to later. We passed a sign that said “Caution! Predator Area“. We kept going for another 20 jostling minutes. We finally made it and got off the bus in “El Eden”. This is where they filmed pretty much the entire Predator film. Yep, the one with the governator in it. 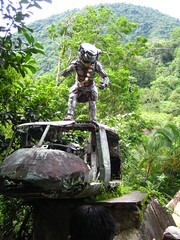 It was pretty cool because as we came down the stone steps, we were faced with a replica of the predator alien on a totally jacked up helicopter on top of a shack. It was huge. The helicopter was a prop that was left behind that I am glad they were able to use to their benefit. It is now a huge restaurant that sits right next to a flowing river with small waterfalls. With all the rain, the waterfalls were all really great. We were hungry by this point, so after walking around and taking photos, we hurriedly ate as much as we could of a carne asada plate (with some awesome guacamole) and hand made tortillas. Then we ran up the stone steps (much harder than coming down them!) while chewing the last bits to catch the bus. So now we needed to head back down to some of the other stops. It wasn’t any less scary the way back. But we made it without a scratch even though there were spots where another car or truck was coming in from the other direction and there were mere inches (as in, perhaps four) that kept the car from scraping the bus. It was either that, or someone went over the side. Second stop was Chino’s Paradise. It was another great restaurant (these restaurants were in locations that would make them great night spots as well, I just don’t think this was the season for that) located along probably the same river and waterfall system. The restaurant here wasn’t open yet but we weren’t really there for that anyway. 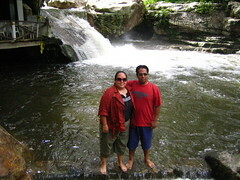 We stopped to hike down to the river and make our way to the bridge that crossed the river to get the nice view of the waterfalls. It was a really neat surprise to come across a totally oblivious iguana on our way back up. It walked across the stone path and stayed resting alongside it. He was not phased by the camera-toting tourists one bit! So off to the bus it was once again and we made our way out of the jungle and into town once again. We made a detour from the way we came up and arrived at a Tequila, uhm, store, I guess. It really wasn’t a factory or anything since it was clearly obvious that this was a place especially made for tourists. It was cute and alright. 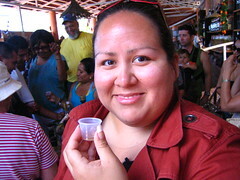 We were met by an extremely enthusiastic, foul mouthed, flirty, and extremely brash, beyond stereotypical Mexican man who was there to show us how tequila is made and to try to get us to by some. The brief rundown is that you have your blue agave plant. After X years (traditionally somewhere around 12), the plant is uprooted and the heart is heated with many others in a pit in the ground. Once they have heated there and cooled off, they get put in a circular pool almost, with a huge stone wheel that is on a pole so that when the mule is tied to it, it will roll the wheel over the agave hearts around in the circle. They had a mini-version where we went. As the wheel crushes the hearts, the sap/liquid is squeezed out a hole at the bottom of the pool and it gets collected and put into containers where they ferment the liquid into tequila. The tequilera that we went to made their own tequila, so when he asked if anyone liked Cuervo or Hornitos, and they raised their hands, he shut them up by calling it garbage. Gives you a cruda (hangover) because of all the sugar water they put in it. He said they make so much of it for industrial purposes that it is all now made with machines, they harvest the plants younger (which leads to not as good a taste), and they try to make up for it with sugars and additives. I know he had his own stuff to sell, but it made sense to me. So I was glad that we actually ate something before going on this taste test so that I could enjoy it without making my stomach weird or my head ache (it had been a full day and not eating a thing would not make me a happy girl). But now it was time for our real lunch. So we all grabbed our well bubble-wrapped purchases and made our way back to the tour bus. 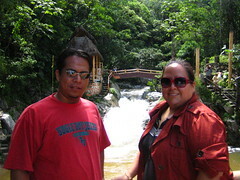 It took us to a lovely little place called “Las Cascadas”, which literally means “the waterfalls”. This place did not have the high vantage point that the other places had, but if we wanted to, we could go horseback riding after our meal along the riverbed (we opted not to). Here we ate some of the most delicious shrimp of our trip. I felt guilty ordering them since shrimp are wonderful enough to be enjoyed on their own, but these were stuffed with some yellow cheese (I am terrible at my cheeses) and wrapped in crispy bacon. OMG. And they were huge. They were absolutely amazing! Ate five of them and I left the rice on the plate. It was well worth the wait. So after we ate, we went walking around and walked across a little rickety wood bridge to a huge pile of boulders that were at the river’s bend. It was a great vantage point for photos and to see the river, the falls, and the restaurant right next door. 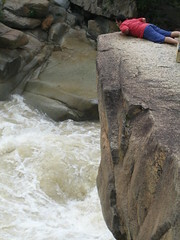 Juan even ventured to the edge of one large rock to see the rushing water below. I couldn’t do it myself. I couldn’t even bring myself to crawl anywhere near the edge, so instead, I took photos. lol I am so afraid of heights (actually, it is the falling down part), it just paralyzes me. I was proud of myself for crossing that little bridge that was five feet long! It was a wonderful touristy trip and by the time we started to make our way back I was very sleepy and actually did knock out while we made it back into town and to the marina where we were staying. We walked around a lot, ate comfortably, and just spent some good ol’ quality time together. We also got to know a little more about the area from the land, and tomorrow’s trip was going by some of the same spots, but by sea, so we were really excited! I don’t quite recall how the day ended, but I think this day I hung out at the pool by myself while Juan took a nap in the room. It started to sprinkle and actually get cold so eventually I went upstairs and we finished off the night indoors. 19 Responses to "You know you’ve been holding your breath for updates!" Thank you! And I really wish I could read what you write most of the time! lol Especially with some of the really interesting photos you post! 😀 Thanks! From here on out, I will try to not be so shy when I am curious. Wow! How awesome! Puerto Vallarta is one of the ports of call on my upcoming cruise in January, and that tour looks like a lot of fun! PS – I’ve been sick since Saturday and I’m hoping to get my post to you today, and if not tomorrow. I just don’t feel up to sitting at the computer for too long right now. Meh. Oh nice! Well, there is another tour that you might want to take instead. I will be posting about that one either tonight or tomorrow. Oh, and as for the post, it’s ok. You’re a pro and I hardly need to a thing to your posts, if anything, so even if you send it in to me at 6pm on Thursday (although I dunno if I will be here my usual late since this time it falls on my bday) it should be fine. Just feel better and get it to me when you can. Yes, I have been holding my breath! This is really lovely to read. It sounds like you two has an AWESOME time! Any plans for tomorrow? Re: Yes, I have been holding my breath! We did have an awesome time. As for plans tomorrow, my mom just called me as well asking what was happening. My answer? I don’t know! lol Juan hadn’t planned a thing yet, I kept asking him what we’re gonna do, and it always ends up with the question being unanswered. I am a little frustrated, to say the least. I dunno if I should assume Juan is planning something or if I will get a rude awakening tomorrow when I realize that we didn’t plan a single thing. grr! OMG that bus ride sounds so scary! Yay! I love reading about your guys’ trip! “Oh Latin America, how you never cease to amaze me with your crazy driving skills.” So true, so true! Hahaha! I was thinking of you when I wrote that! Instead of just saying “Mexico”, I changed it to “Latina America” for you! I was so scared of hitting a wave and flying off that I tried to make sure that I wasn’t going too fast when the waves came.But there were a few moments that had me white-knuckled! Really great pictures. I wouldn’t have liked the bus ride at all. But te trip sounds fantastic! I just drooled through your post. Bus, view, hike, food, nice view, hike, food, bus, heights, food, food food. Incredible pictures and oh man the food!